If you are planning on bringing along the kids on your vacation to the tropical coastal paradise of Puerto Vallarta, be sure to check out our activities geared specifically for children. 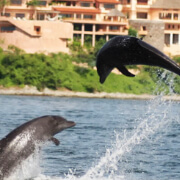 Kids will not be bored while visiting Puerto Vallarta; we offer kid-friendly entertainment, educational nature activities, and exciting outdoor adventures that are especially designed to intrigue young minds, sparking both their fertile imaginations and providing inspiration for an active and inquisitive life. 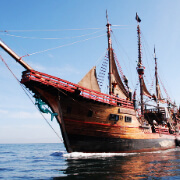 If your child is intrigued by pirates, like those portrayed in the Pirates of the Caribbean film series, they’ll be delighted by the Hollywood style entertainment productions on the deck of our authentic replica pirate Galley. Kids can participate in the action, joining fun games and contests on the deck of the Marigalante. If kids get a kick of Captain Hook from the children’s classic, Peter Pan, they will really enjoy participating in the operation of our facsimile of an Eighteenth Century sailing vessel. We keep kids minds and bodies active on our children-oriented tours, including encounters with dolphins at our Puerto Vallarta marine mammal facility. 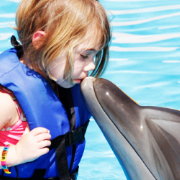 Children are always charmed by our intelligent, charming, and gentle Pacific Bottlenose Dolphins. 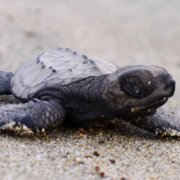 We also offer a fantastic tour of a marine turtle nursery, where children can release their very own hatchling into the waters near Puerto Vallarta. This is an excellent tour to teach kids the importance of marine conservation efforts. After joining our professional staff encountering dolphins, releasing turtles, or even learning to scuba dive, your children will gain a life-long appreciation for the natural world. 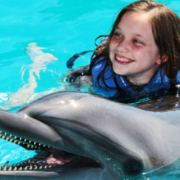 Kids will love our dolphin encounter especially designed for them. If you have a child between the ages of four and eight, this is a great opportunity for them to have an up-close encounter with our pleasant and mischievous Pacific Bottlenose Dolphins.